Would you make a good engraver? Take our career test to find out how you match with this and over 800 other careers. What is the workplace of an Engraver like? An engraver is an artist that etches specific designs, words, and even images onto different types of materials. The design or the image is based on a client’s specifications or the artist’s own personal designs. A modern engraver can use precision lasers to achieve their final results, or they may use hand tools and a magnifying glass depending on how they have been trained. They can work on glass, metal, stone, wood and other materials, and can also engrave and create custom plates made of metal or wood that can be used for stamping images on paper. 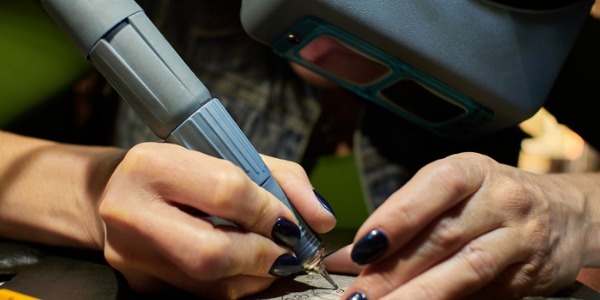 Certain engravers will work with hand tools to create custom pieces of art by first stencilling their design pattern onto the chosen medium and then carefully, slowly, and patiently etching away the design using the tools of their choice. While engraving, they will wipe or blow away the material from the chosen medium and then sand down the edges to create a beautiful finished project. Depending on the specifications, they may then go further and embellish their design with jewels, paint, or other materials. Images or phrases can also be engraved onto stamps and a variety of surfaces, including picture frames and wedding rings. Depending on where engravers work, there may be customer service aspects to the position. Potential customers may want to see examples of an engraver's work or to work closely with the artist to create a unique design. An engraver who works with customers will often work independently, through a shop, or a network of specific vendors. Engravers can also be independent artists who sell their artwork at stores, craft fairs, and online stores. Engravers who work with lasers instead of hand tools will still be able to create beautiful engravings on jewelry or many other types of material. In fact, many artists prefer working with a laser, as it allows them to work on many different types of materials and create even more exact and precise designs. Engravers who work with lasers will also have employment options with larger corporations on projects of larger scale. The United States Bureau of Engraving and Printing uses lasers to create custom plates that will be used as the bases for stamps and currency, and many organizations use lasers to etch information onto materials. Are you suited to be an engraver? Engravers have distinct personalities. They tend to be realistic individuals, which means they’re independent, stable, persistent, genuine, practical, and thrifty. They like tasks that are tactile, physical, athletic, or mechanical. Some of them are also conventional, meaning they’re conscientious and conservative. Does this sound like you? 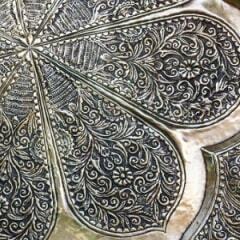 Take our free career test to find out if becoming an engraver is right for you. Engravers must be able to work under pressure and meet deadlines dictated by their clients. They will need to maintain a clean workspace and keep their equipment clean and sharpened. Some will work in a retail environment, where they will have to be able to talk with customers one-on-one to create customer-specific engravings. There is also work available on larger projects, where the engraving is completed with lasers. The engraver will still create the plates or other objects to specifications and maintain deadlines. They will also be responsible for keeping their equipment and workspace clean and in good working order. Engravers must also understand ordering the necessary supplies for specific projects, including the tools and medium to be used.